Oops, who thought today was Thursday? Bingo, me! I do have a card to share today that is a simple vintage style that I reserve for sending to a vintage friend or a young girl. I just love silhouetted pictures – the are so classic and the picture tells the whole sweet story. This is a card I’ve sent out more than once for just the occasion that I mentioned. Layering and borders always save the day and give so much texture. Today is Day of Giving Friday! My card shown today is up for grabs to a sweet reader who leaves a comment. For new readers, every Friday it’s my pleasure to give away a card. The card goes to a randomly picked reader (worldwide) who leaves a comment in our conversation. Want to know more about Day of Giving, here’s a link to my FAQ’s just check out #11. You can check the list of winners HERE! By the way, I loved reading what everyone collects last week!! For your comment: What craft would you do if you had all the time in the world? By the way, I breezed right by the details during the hectic-ness of the week but so wanted to let you know that my trip to Canada was amazing! Niagara Falls was on my bucket list and was truly spectacular to behold. My vantage point was from the Canadian side; it was raining buckets but that didn’t bother me at all. To see such God created beauty reminds me to take a second and breathe in life and to forget about the small things petty things that often tug at our attention. The biggest highlight was the class I got to teach – I met several ”Gracelets” that drove from quite a distance to take my class and just knowing they are out there makes me smile. Why? Because so much I do is online and it’s a beautiful blessing to get to meet you all in person. I also attended a retreat with some pretty magnificent designers :-) As always the crew here absolutely makes my day – this week I finally had a chance to show you my book that has been a blessing to make. You’ll see it again because I’m going to make myself use it!! Sending hugs, see you soon!! Sorry i forgot to say that if i had all the time to craft it would definately be card making and to find the time to learn new skills would be so fantastic. Still loving car making, so would continue doing that!!!! Well, I may have thought today was a different day, except for the fact that it’s my birthday…and even though I’m 47 today, I still have fun with my birthday…and I never mind the number getting bigger every year. LOL Spent the day with the Man I love for the most part!! 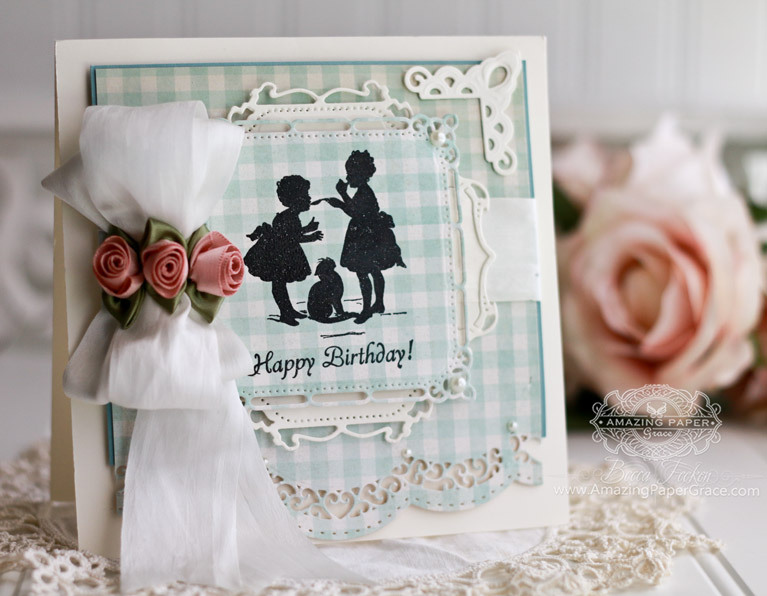 Your card is adorable, love the vintage feel…and I agree have always loved silhouettes. Such a sweet, sweet card! If I had all the time in the world, I would garden and make cards. Both bring such relaxation to my being and allow my creativity to leak out! If I had all the time that I would love to craft, it would be cards, love making them and you have just changed my mind about using silhouettes. Love the way you have used it on the patterned paper. I really enjoy making cards and also paper flowers for the cards. Hi Becca. For me Quilting and Card making. Love this little card. Quite unusual. Good morning Becca, fabulous card I love it!!! Perfect for any age!!! Love the gingham check designer paper and the rolled ribbon roses! todays card is so cute and timeless. I love it. blue is my fav. color too. I love this card, love the silhouettes. I would like to spend more time planning and cooking different ethnic foods with good presentation. This is such a sweet card . Unknown to most but my birthday is coming up on the 26th. I will not be able to celebrate it though. Family is out of state helping my mother-in-law whose 90th birthday we will celebrate July 4th. We are celebrating it early. Her real birthday is December 17th. Sometimes when I see your wonderful cards I like to pretend that you made them for me since I very rarely get a card for the sake of just being loving. Especially now that I have been diagnosed with Dysautonomia -this simply means that my involuntary nervous system, the one that does the automatic operations such as heart rate and breathing, is failing. I have tried most crafts and loved my creations , but i would like to try Patchwork i have looked into getting a lesson but gosh they are so expensive . Wow, if I had all the time in the world, I would do many crafts; cards, knitting, sewing, rug hooking, felting, painting, mixed media, and whatever else catches my fancy! A sweet card from the sweetest person! Seeing your post was a bright spot in my day. My very first thought in response to your question was that I would spend a lot more time making cards but that’s a craft I already do. The next thought was I would learn how to do tatting, because I love lace! Between my singing activities and card making I don’t think I’ll be lace-making any time soon, however! I imagine you’d need another lifetime to do all the things you’re interested in, right? I absolutely love this card Becca! 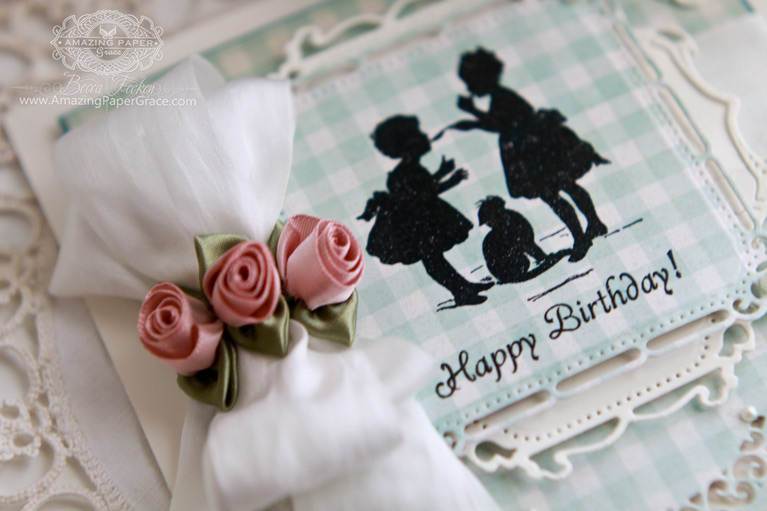 The vintage look is one of my favorite styles and makes a beautiful card. 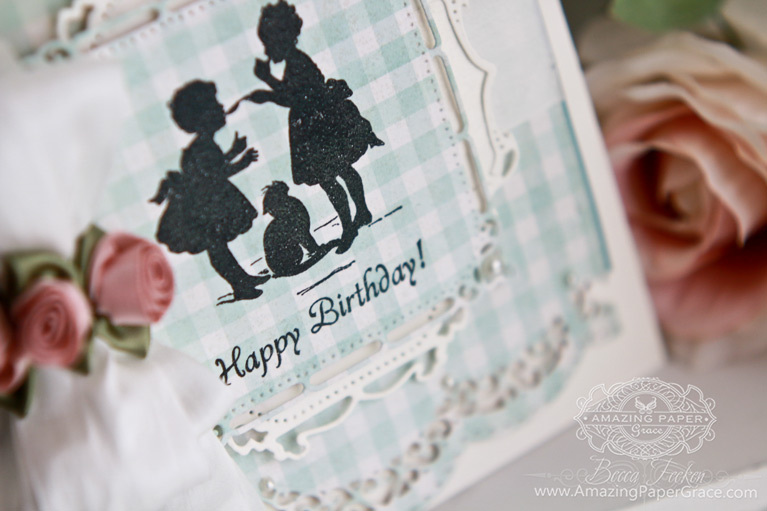 Love this card Becca…silhouettes! I have several that I cherish. Your class was wonderful & was worth the drive. It was great to meet you. You are a terrific person..a great teacher with lots of patience & I enjoyed it so much. Becca your card is beautiful – as ever :-). What craft would I do if I had unlimited time – I can’t stop at one, but card making and lace making would be the two I would choose, closely followed by embroidery…. Love, love, love this card. The checkered paper, the die cuts, embellishments, there all just a perfect fit for your sentiment and image. Warms my heart! What a beautiful card here again Becca, I love solouettes, so this really speaks to me too. I would switch up the crafts… Love them all… Card making, sewing, knitting, water colours(beginner), stained glass, pottery and on and on. Glad you like the fall the Canadian side is the best side to see both Falls. Next visit… Go on the Maid of the Mist.. The boat tour that comes right up to the Falls. It is so exhilarating to be so close to the rushing falls… It’s a must do to experience the power of the water… A Must do. We live about 45 min from the Falls in Canada and love visiting too. It’s very nice in the winter too with the ice forming from the frozen mist. What a sweet card, Becca. Love that gingham! So happy to hear of your success and fun adventures in Canada. What a blessing it must have been for those folks to have you teaching in person! What a delightful card that anyone of any age would be happy to receive! If I had all the time in the world, I wouldn’t change what I’m doing – creating cards for all occasions and albums for special birthdays. It would mean I had more time to spend on each one. Hi Becca … for me it has anything to do with paper/card. If I can turn anything 3D in a happy girl… I’m loving making flowers at the moment. Cute card. I’m at a kids birthday party later today. Another really pretty and simple card. So sweet! Love the tiny roses. Where would I go to see a Tutorial on the Roses & Leaves? This is the most gorgeous card today, so sweet and just perfect. I would stamp and colour if I had all the time in the World, but then if I had all the time I’d also sew and knit!!! Oh this is such a sweet card, just love it Becca. 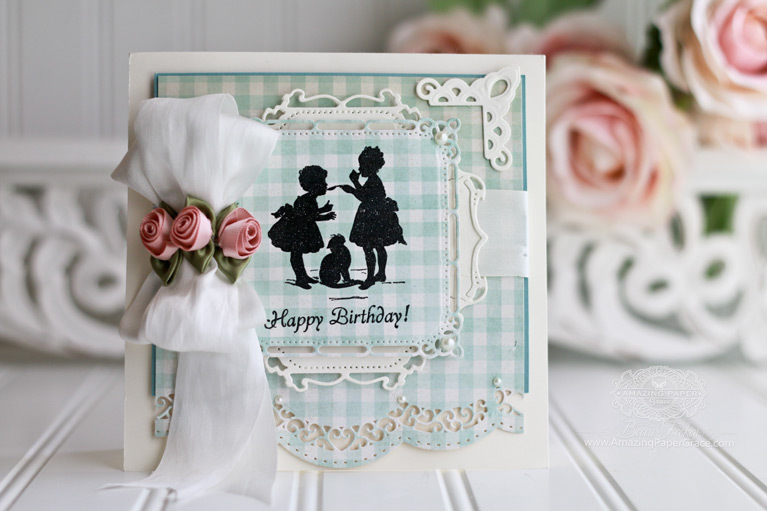 Hi Becca, This card is so beautiful and pretty, I love the die-cuts, I love the gingham and the beautiful bow and flowers and I truly love the delightful silhouette stamp. If I had all the time in the world I would be starting Scrapbooking and also hopefully starting Quilting, these are two projects that I haven’t had time to start yet but I really ‘want to’. So glad your trip to Canada was fabulous, and the lucky lucky ladies who got to craft with you must have been over the moon. A lovely card! I love the look of silhouettes also but have never made a card with one. I do have some perfect dies for it so I’m inspired by your card! I pretty much have a lot of time to craft but health issues keep me from it and I find that frustrating. 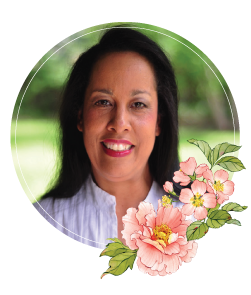 I’ve always sewn, made porcelain dolls from molds, designed the costumes for my dolls, scrapbook, cross stitch, card making. I love them all but right now I would love a steady diet of card making. I have so many ideas in my head but my health just interferes. I know God has a reason for this season of my life so I’m trying to move forward with faith. Such a pretty card, Becca! Everything works so well with the silhouette. If I had more time, I would love to make jewellery, do machine embroidery, start using my knitting machine again, learn more advanced icing techniques – oh the list could go on and on! Saw your blog post the other day then forgot to comment. This card is pretty! Great card for any age. I love the silhouette look. It is simple yet makes a statement. If I had all the time in the world it would be making cards, playing especially with my APG dies & scrapbooking. I also do enjoy making paper sculptures with my silhouette machine if time allows.